When you’re a highly trained chef who’s had stints on the Food Network’s Beat Bobby Flay and Chopped, creating dishes on the fly is no cause for concern. At least, not for Chef Justin Gaines. Soon after Gaines and Lou Reda opened Lou Reda’s: An American Table in 2013, a woman walked into the restaurant and handed her server a card with 20 or 30 dietary restrictions. Gaines whipped up a special dish for her. Gaines and his kitchen team often cook off-menu items for guests at Lou Reda’s. That’s the attention to detail that Reda and Gaines have tried to bring to Rocky Mount. Now, instead of heading to a chain restaurant or driving an hour to eat in Raleigh or Greenville, local diners have an option where they can get basics like rib eye or salmon — as well as dishes like Vietnamese five-spice chicken or scallops with squid ink risotto. Gaines says the best way to do that is through fresh ingredients and classic techniques. He and his staff make all of their sauces and dressings in-house. They focus on the “mother sauces” of French cuisine, like béchamel, which they use in their mac and cheese. They also butcher their own meat, create their own spice blends for rubs, and prepare seafood that’s delivered daily from the North Carolina coast. Creating in the kitchen comes naturally to Gaines. His mother got him a restaurant job as a dishwasher when he was 13. By the time he was a senior in high school, he was prepping food and cooking, and he knew that he wanted to cook professionally. After graduating from the Culinary Institute of America, the New Jersey native worked as a chef in restaurants from New York to Alabama. That’s where he met Reda in 2009, when they were both consulting on the opening of an Italian restaurant in Montgomery. They hit it off immediately. Both understood that although their approaches sometimes differed, their respective goals were the same: give the diner good food, good service, and a great experience. After running a chain restaurant in Rocky Mount for 15 years, Reda opened An American Table in October of 2013, with Gaines in the kitchen. Set in a strip shopping center, the unassuming facade makes way for what Gaines describes as a “modern-cool but comforting” interior. “We wanted it to not look like the usual restaurant in Rocky Mount,” he says. The menu also reflects that “not what you’d expect in Rocky Mount” vibe. 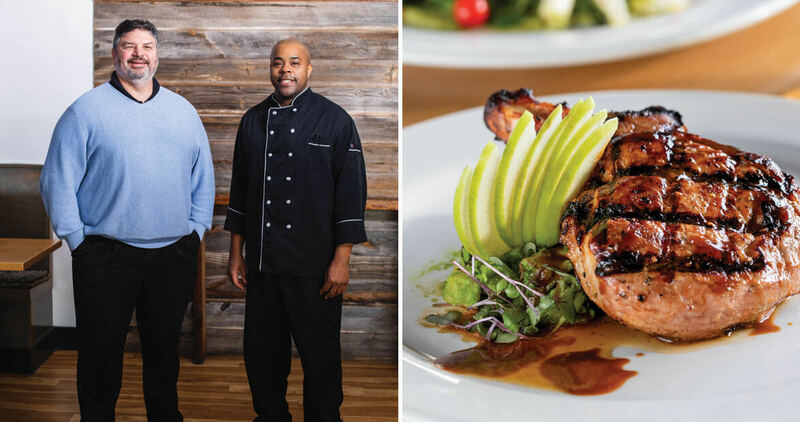 But in the early years, offering dishes like bone marrow, Reda and Gaines discovered that Rocky Mount didn’t eat like that — yet. Five years ago, the city wasn’t ready for a dish that was gaining popularity in larger metropolitan areas. That didn’t stop Reda and Gaines, though. “We needed to help accelerate that evolution,” Reda says. He credits Gaines with pushing the envelope on dishes in Rocky Mount. But timing is everything: After bone marrow disappeared from Lou Reda’s menu, the two tried again at Tap@1918, the establishment they opened together in 2017, and bone marrow is now flying out of the kitchen. “Chef always pushes us to grow,” Reda says. 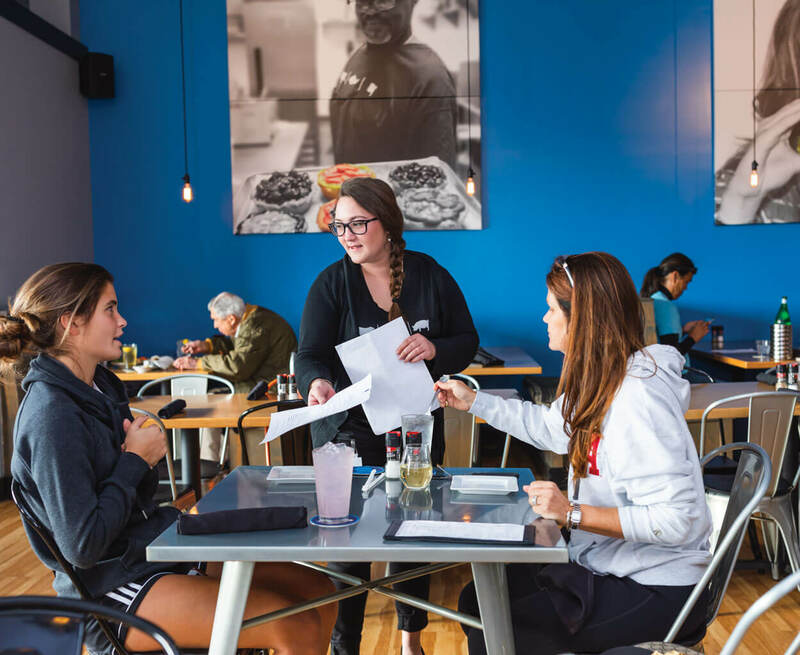 “Something we do that not a lot of kitchens do is we give our cooks as much free rein as possible to come up with their own recipes.” Either at Lou’s or the Tap, drunken noodles, poutine fries, and beet sausage have found their way from their cooks’ imaginations to the menu. Reda and Gaines want to help Rocky Mount grow as a community, and they believe that taking chances with food and drink is the path to growth. Gaines calls this line of thinking “food politics”: He watches what goes on in the world’s restaurants, and then he brings his findings home.